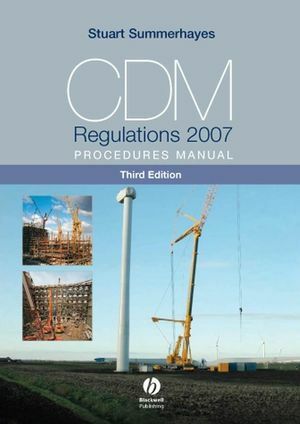 This Procedures Manual provides a documentation system which has been developed by a practising CDM co-ordinator for use with the Construction (Design and Management) Regulations 2007. The Manual also takes account of the 2007 Approved Code of Practice. It will function as a control document for quality assurance purposes. Stuart Summerhayes is a chartered civil engineer and a fellow of the Association for Project Safety. After an early period in heavy civil engineering contracting he spent an extensive period in university education delivering construction related undergraduate and postgraduate courses. For the past decade he has been delivering a portfolio of CDM related courses and project management training to industry as well as managing planning supervision/CDM co-ordination teams across numerous sectors of construction. He is the managing director of Synergy Construction Management Consultancy Ltd, which was the first accredited and validated training provider for the Association for Project Safety in the delivery of 'The Management of CDM Co-ordination' courses, which are offered as open and in-house courses throughout the UK. He is also the president of APS. Section 2 Application and interpretation. 2.1 Application; Table 2.1 The main responsibilities of duty holders; 2.2 Interpretation; 2.3 Additional exclusion. Section 3 All duty holders. 3.1 Introduction; Table 3.1 Project management descriptors found in the regulations; Figure 3.1 Holistic diagram. Section 4 The client . 4.1 Client fl owchart: all projects; 4.2 Client flowchart: notifi able projects, additional duties; 4.3 Client checklist; 4.4 Client checklist: notifi able projects. 5.1 Introduction; Figure 5.1 Regulations to be discharged by designers; 5.2 All projects; 5.3 Identifi cation; 5.4 Evaluation; 5.5 Contribution; 5.6 Design change; Figure 5.2 Systems approach for the designer; 5.1 Designer flowchart: all projects; 5.2 Designer flowchart: notifiable projects, additional duties; 5.3 Designer checklist: all projects; 5.4 Designer checklist: additional duties for notifi able projects. Figure 6.1 Contractor duties: all projects; 6.1 Contractor flowchart: all projects; Figure 6.2 Contractor: additional duties on notifi able projects; 6.2 Contractor fl owchart: notifi able projects, additional duties; 6.3 Contractor checklist: all projects; 6.4 Contractor checklist: notifi able projects, additional duties. Section 7 The CDM co-ordinator. 7.1 Introduction; 7.2 Appointment; Figure 7.1 CDM co-ordination duties; 7.1 CDM co-ordinator flowchart; 7.2 CDM co-ordinator checklist. Section 8 The principal contractor. Figure 8.1 Regulations to be discharged by principal contractor; 8.1 principal contractor flowchart; 8.2 principal contractor checklist. 9.1 Introduction; 9.2 Pre-construction information; Figure 9.1 Flow of pre-construction information and Pre-construction information: tender stage; 9.3 Construction phase plan; 9.4 Health and safety file; 9.5 Project risk register; 9.1 Project risk register (health and safety). Section 10 Checklists and agendas. 10.1 Checklist for non-notifi able projects;10.2 Checklist of additional duties for notifi able projects; 10.3 Initial design/client meeting: prompt list; 10.4 Pre-start meeting: prompt list (non-notifiable projects); 10.5 Pre-start meetings: prompt list (notifiable projects); 10.6 Progress meeting: prompt list.